Since our launch on February 25, 2012, thanks to your generous contributions, we have raised over PhP1.1 Million for our Patient Welfare Fund for the UP-PGH Dept. of Neurosciences. Of this amount, we have spent over P120,000.00 in medical procedures and medicines that have helped three patients overcome serious brain conditions as well as permanent nerve damage. The global phenomenon that was the ALS Ice Bucket Challenge, has taken our country by storm in the past couple of months. Along with it were the different ways that people accepted the challenge and raised awareness for Amyotrophic Lateral Sclerosis, more commonly known as ALS. For instance, in an effort to exhibit unity and national pride, Doha, Qatar conducted the first ever city-wide ice bucket challenge last month. With more than a hundred participants, they were able to raise about a thousand dollars which was donated to the ALS Association. Three cities were nominated in the process, namely: Dubai, Manila and Beirut. Known for our enthusiasm towards charity, and readiness to take on something new, we Filipinos were obviously thrilled to take on the challenge. Project Awesome, a non-profit organization known for social mob missions, led the event. Within 2 weeks, they were able to spread the word online and pulled off the successful #icebucketph last Sunday, September 7, 2014, in the Quezon City Memorial Circle. Around 200 eager Filipinos, including those who came from the nearby provinces like Pampanga and Laguna gathered for the cause. To avoid wasting water, Zambales seawater was provided for all the participants. The most heart-warming point of the event was the effort of Project Awesome to prioritize nationalism and dedicate the collected voluntary donations from the participants to Filipino ALS patients by coursing it through Let’s Save the Brain Foundation. They opened a donation booth in the event and were able to raise a total of Php 2,205.00, which was accepted by Dr. Lourdes Ledesma on behalf of LSTB. Dr. Ledesma expressed how every donation counts and how LSTB appreciates the event’s effort to help the more needy local patients, instead of donating it to the international organization. Being a rare disease in the country, there has only been a total of 22 recorded cases of ALS patients in the Philippines in the past 5 years. With the help of the ALS Ice Bucket Challenge, it is evident how much the awareness on ALS has increased exponentially. Just as equally important, it has also raised the hopes of the ALS patients in combating the disease. We can only hope that this will also open opportunities toward a similar united support of communities to patients with other neurological conditions that need immediate care, medicine and procedures. Finally, we hope that this will increase more awareness for the cause of LSTB and its unceasing effort to help indigent patients in the UP- PGH Neurosciences Department. Together, we can save lives! More and More Patients Helped! Dear friends, on behalf of Let's Save The Brain, we would like to thank our friends and donors who have helped our patients so far! 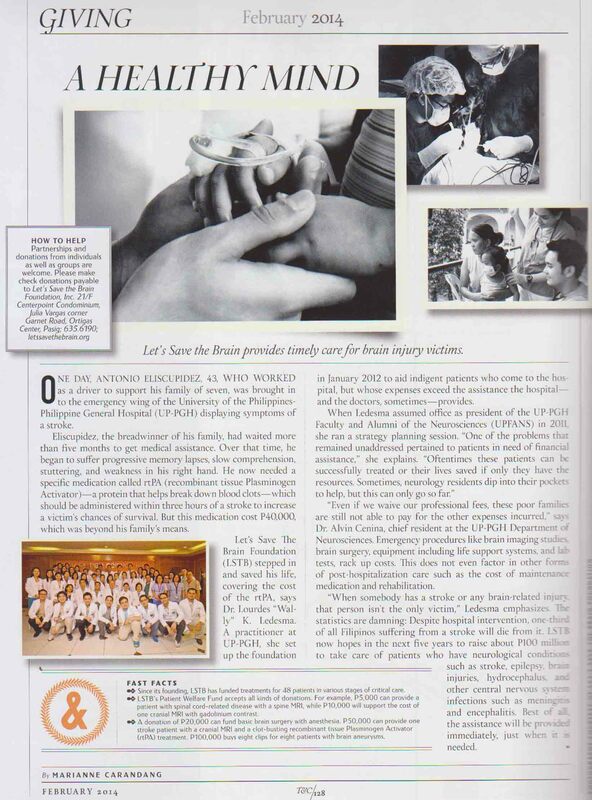 Last year (2012), from the time the foundation was officially launched, we have helped 13 patients with neurological disorders at the Philippine General Hospital. This year (2013), in a span of 8 months we have nearly tripled the number of patients given financial assistance for their recovery! Thanks to your help, patients are receiving the treatment that they need when they need it the most. You have given them a second chance. Thank you all so much! More indigent patients come in every day to our pediatric and adult neurology and neurosurgery wards. More people will be needing your aid. Help us help them. Town and Country Features LSTB!